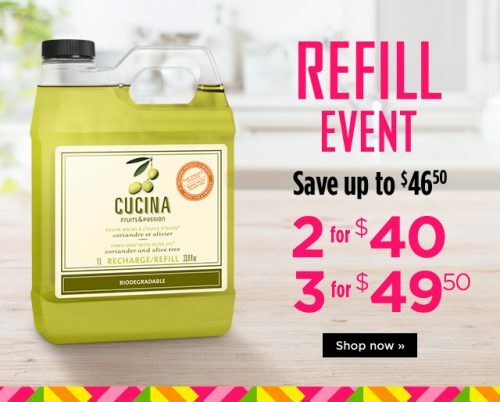 Fruits & Passion Canada is giving you a chance to save up to $46.50 for those of you that are shopping within the refill event. Right now, you can buy two refillable hand soaps or foaming bath products for just $40 or three for just $49.50. Seeing as one refillable bath soap or foaming bath product (1L) is usually sold for $32, you could be saving anywhere between $24 and $46.50. The refillable event will only be going on for a limited time, so I suggest you stock up now so that you won’t have to worry about refilling for a long, long time. Fruits & Passion also offers FREE shipping on all orders that are $35 or more.